Ford developed its autonomous driving technology -- displayed in this Fusion Hybrid -- mostly in-house. 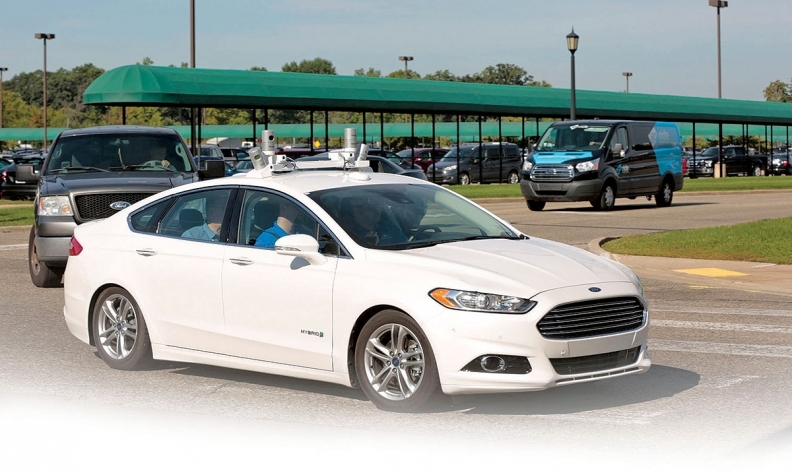 Armed with deep pockets and decades of industry experience, automakers are leading the race to deploy autonomous vehicles, according to a report by Navigant Research released Monday. Ford Motor Co., General Motors, Renault-Nissan and Daimler are best positioned for long-term success in a self-driving car future, according to Navigant. The report evaluated 18 automakers, suppliers and tech companies in the space and ranked them based on deployment strategy and execution of their plans thus far. The four leading automakers have developed capable advanced driver assistance systems for commercial use, have outlined detailed plans for future technologies and have taken steps toward those goals with strategic partnerships and investments. • Ford Motor Co.: Under CEO Mark Fields, Ford has gone full speed ahead on autonomous technology. The automaker has invested in lidar sensor-maker Velodyne, Civil Maps and artificial intelligence company Argo AI and acquired ride-sharing startup Chariot. In January, Fields said the company would invest $700 million in its Flat Rock Assembly Plant in Michigan to develop Level 4 autonomous vehicles -- which require no human intervention in certain environments. Ford also plans to produce Level 4 autonomous vehicles for commercial operation in mobility services, like ride-hailing and ride-sharing in 2021. • General Motors: GM has been making similar high-profile efforts, investing in ride-hailing company Lyft and acquiring self-driving startup Cruise Automation. The recently released Chevrolet Bolt will be the automaker’s flagship self-driving vehicle, GM CEO Mary Barra said in December, and the company will begin testing the vehicles on Michigan roads this year. • Renault-Nissan: The alliance launched its ADAS technology, which is capable of self-driving in a single lane on highways, last year in Japan, and will roll out the system in the U.S. with the second-generation Nissan Leaf. Nissan Chairman Carlos Ghosn said the automaker plans to begin production of autonomous vehicles in 2020. • Daimler: The luxury carmaker has put significant effort into ADAS, releasing semiautonomous systems similar to Tesla Inc.’s Autopilot in the Mercedes-Benz S class and E class. The automaker has also said it would partner with Uber to supply self-driving vehicles to the ride-hailing service. BMW, Volvo Cars, VW Group, Hyundai Motor Group, Tesla, PSA and Toyota Motor are close behind the top automakers in the report’s rankings. Google’s self-driving arm, Waymo, and suppliers ZF and Delphi are also in the second wave of contenders. What separates these companies from the leaders, according to Navigant, is a lack of partnerships, investments or consumer trust -- factors that could easily change as these technologies develop and future announcements are made. Honda, Uber, self-driving startup NuTonomy and Chinese technology company Baidu bring up the rear. These companies lack a clear strategy for deployment and adequate public road testing of their technology, the report states. Uber in particular faces an uphill challenge. In February, Waymo filed a lawsuit against the ride-hailing company, claiming a former Google employee stole its lidar sensor designs and brought them to Uber. Waymo has also demanded that Uber cease its self-driving operations -- a development that could significantly hinder Uber’s efforts.